Sometimes it's easy to forget that Henri de Toulouse-Lautrec painted more than theater goers, dancers, and the iconic posters that decorate many a Francophile art student grimy apartment. Toulouse-Lautrec was no stranger to pain, physical and emotional, and had a front-row seat to the seedy lives in Montmartre . 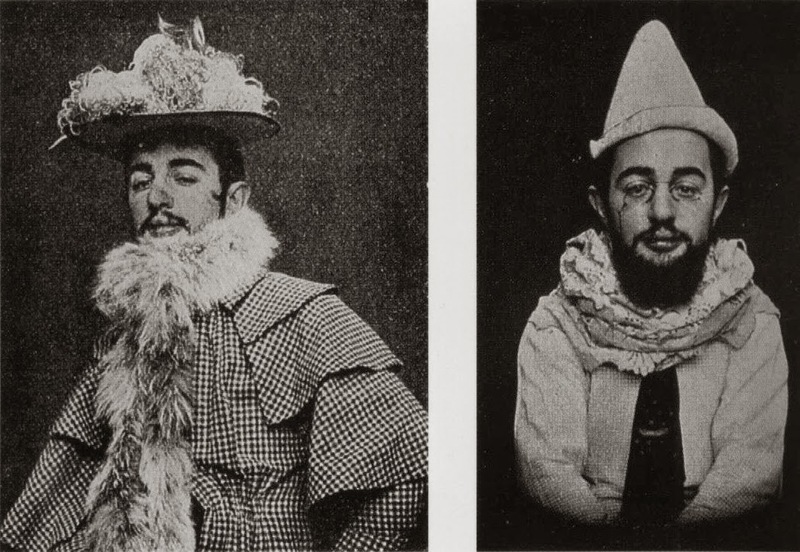 But there was also another Toulouse-Lautrec, one that despite the hand life dealt him still maintained a sense of fun and an eye for the ridiculous. This is apparent both in his circus drawings as well as in some of the photographs depicting him wearing various costumes and funny hats. Perfumer Dawn Spencer Hurwitz of DSH Perfumes was inspired by one of Toulouse-Lautrec's less known works, a drawing named "The Dunce's Cap" (circa 1888-1890), and created Amouse Bouche (not a typo) as part of her collaboration with the Denver Art Museum for their Passport to Paris exhibition. Amouse Bouche is an unapologetic gourmand perfume. The main star here is a strawberry note, which is usually something that sends me running for my life. But DSH takes her strawberries and wraps them in so many layers of stuff that you will find no resemblance to fruity floral perfumes as we know them today. As a matter of fact, even the love song to classic aldehydes (which were among the first synthetic notes that were developed in the very late 19th century) will not appear too familiar. I smell no connection to Chanel No.5 nor to any other iconic fragrance. Though perhaps there's a link to the modern outrageousness that must have been several Coty perfumes at the time. Aldehydes or not, Amouse Bouche doesn't feel like a true floral at any stage of its development. My skin is notorious for amplifying all that's sweet and edible, and this DSH perfume is no exception. The fragrance goes from a delectable strawberry preserve spread over butter and served with clotted cream to a caramel-vanilla dry-down. This is fun, delicious and more than a little out of my personal comfort zone, yet I find it irresistible. Dawn Spencer Hurwitz has never crossed the lines of good taste, and she wasn't about to do it here. She simply gave us joy and playfulness in a form of a perfume, and for that I am deeply grateful. Notes: aldehydes, strawberry, bergamot, lemon, jasmine, bulgarian rose, neroli, ylang-ylang, butter, tahitian vanilla, ambrette (musk mallow), caramel, tonka bean, australian sandalwood and vetiver. DSH Perfumes- Amouse Bouche ($63, 10ml EDP. Other sizes, concentrations, and samples also available) can be purchased from dshperfumes.com. The sample for this review was sent for my consideration by the perfumer. This perfume was, for me, a lesson in trust. It proved that in the hands of a truly brilliant perfumer, even notes that I wouldn't normally gravitate towards (strawberry in particular), can be turned into an amazing and beautiful scent. When I initially sampled it I remember thinking that if there were a perfumers version of that Food Network show Chopped Dawn would surely come out as one of the winners - even an All Stars Champion.